FxWirePro: Are GBP options markets weighing on Brexit developments? Sterling may not go as per the consensus, needless to specify that, especially following the recent Brexit developments. Theresa May who is still desperately attempting to get the House of Commons to vote for her exit deal. As if this plan was not being difficult enough, another major obstacle emerged yesterday. The Speaker of the House of Commons, John Bercow, prevented a third vote on her agreement – unless it contained significant changes. One can’t blame him, as the MPs have been debating May’s deal for months with one vote following the previous one without this so far leading anywhere. However, the news came as a big blow not only to May but also to the GBP bulls – or that is what we would have expected. Sterling indeed eased in reaction to the news yesterday. However, considering that the chance of an orderly Brexit by mid-2019 has been dealt a major blow, the losses were quite modest. Two explanations suggest themselves: market participants think that May may be able to somehow meet Mr. Bercow’s demands or avoid them so that a vote can take place within the next two days, i.e. before the EU summit. Or they had not expected the House of Commons to agree to the deal anyway, even if a vote had taken place; despite the fact that some of the signals that had emerged on the latter had also been positive. Should it really be the case that the market had already written off May’s deal, there is one thing that particularly surprises me and that my boss Ulrich Leuchtmann had already referred to at this juncture at the end of last week. 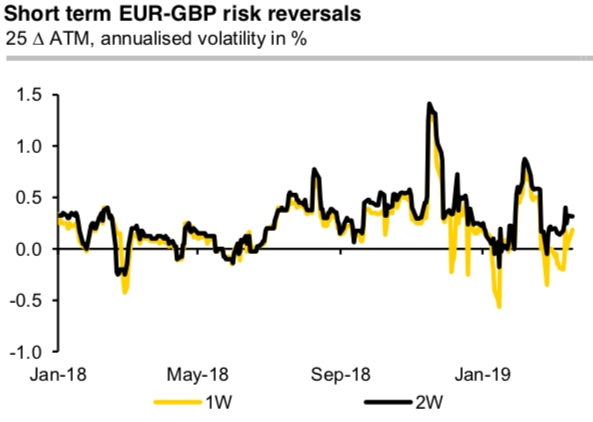 The short term risk reversals in EURGBP (and GBPUSD) are trading close to zero (refer 1stchart) which cannot be explained with the market only weighing the options 1) no-deal Brexit or 2) postponement of the Brexit date. As 1) would be significantly negative for the British currency and 2) could turn out to be nothing more than a postponement of 1). That means that really the market should price at a higher risk of significant Sterling losses. The explanation for the market still seeing upside as well as downside risks is that it had not yet given up on May’s deal despite the renewed defeat in the House of Commons. However, yesterday’s market reaction causes me to question this explanation. Of course one could argue that in case of a postponement of Brexit the likelihood of Sterling positive scenarios rises more considerably than that of a no-deal Brexit. This could be a second referendum in which voters decide to remain in the EU, or early elections from which Labour emerges as the winner, after which the government negotiates a new deal which is based on closer trade relations with the EU. All that is very well. However, what does not fit into this picture is that the longer term risk reversals, i.e. for the 3 or 6 months horizon, price in higher GBP depreciation risks (refer 2ndchart). If the market sees a higher likelihood of a longer postponement of Brexit why does it nonetheless have such a negative view of Sterling? That does not seem fundamentally justified. In case of Brexit being postponed well past the middle of the year a share of the recent investment backlog could dissolve, with the Bank of England potentially starting to think about a further interest rate normalization again. Currency Strength Index: FxWirePro's hourly EUR spot index is inching towards 23 levels (which is mildly bullish), while hourly GBP spot index was at -65 (bearish) while articulating (at 13:13 GMT).